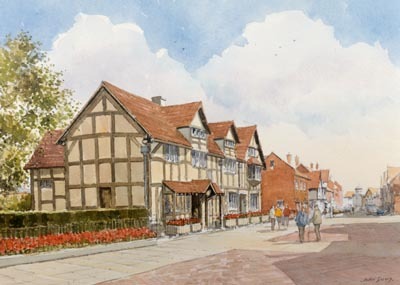 Stratford-upon-Avon, Warwickshire - accommodation in: B&B, hotels, country inns, self-catering. Providing the very best accommodation within the area, from Luxury Hotels, Country Inns, Bed & Breakfast, or Self Catering Accommodation, there is something to suit everyone. Whether you choose to be in town or out in the country (this is rural England where the countryside is beautifully pastoral), you will find the warmest of welcomes. There are large and small establishments, with varying prices. Throughout Britain every year, the tourist boards now inspect over 30,000 places to stay, in order to help you find the ones that suit you best. The Accommodation Rating System was designed to list establishments by facilities offered. In addition there are a number of independent rating organisations such as The AA (Automobile Association), the RAC (Royal Automobile Club) etc., where their own applicable ratings are listed with the establishment.